First of all, chock the front wheels of the car. 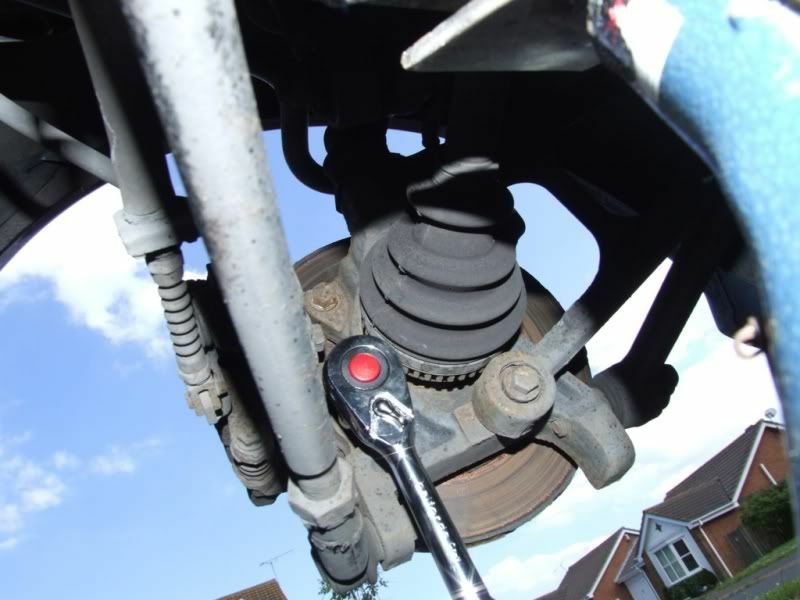 This will prevent the car rolling forward when you release the handbrake to work on the rear brakes. I have a proper landrover chock (from my offroad days) and I also used a chunk of wood for the other wheel. 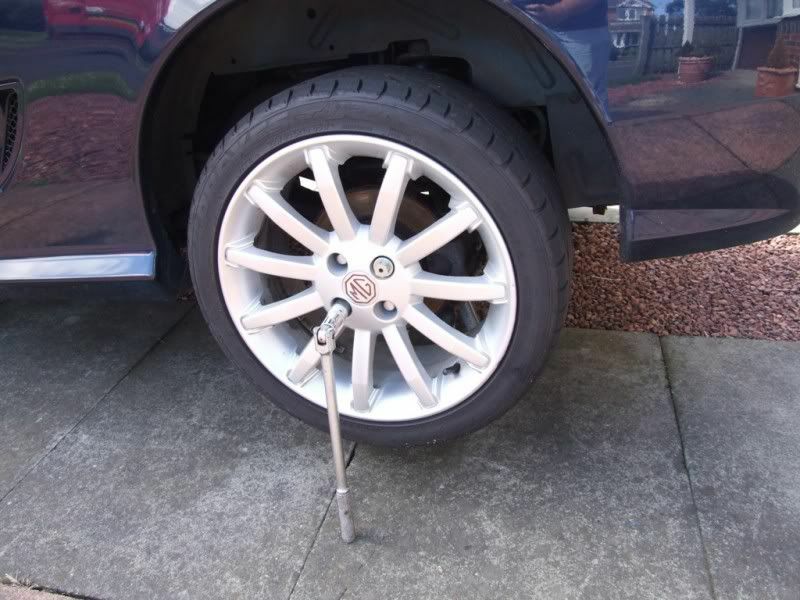 Loosen the wheel nuts (this is easier with the wheel on the ground), Jack the rear of the car up and support it on an axle stand. 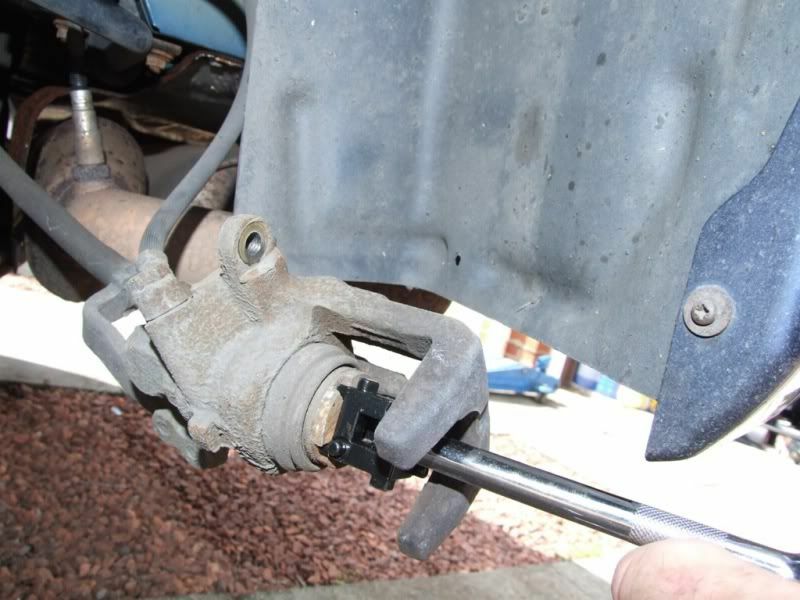 DO NOT work on the car without axle stands. It is dangerous and could cause serious injury if the jack fails. Remove the wheel nuts and remove the wheel. We can now see the disc and calliper. The reason it is so rusty is I just used some alloy wheel cleaner the day before and is rusted all of the discs, so beware when using this stuff. 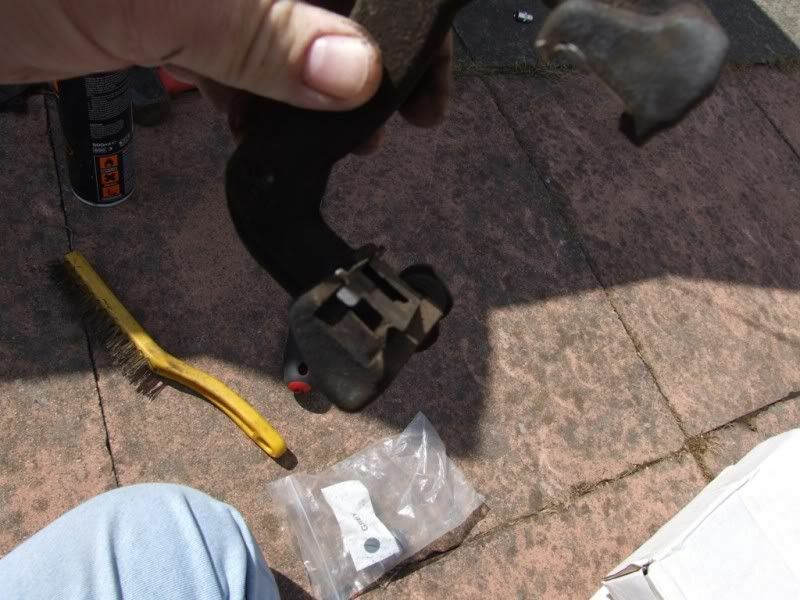 and remove the centre section of the calliper assembly. Note...I had to use a drift and hammer to remove the calliper assembly. Be careful not to damage the assembly. The piston assembly will now swing free. 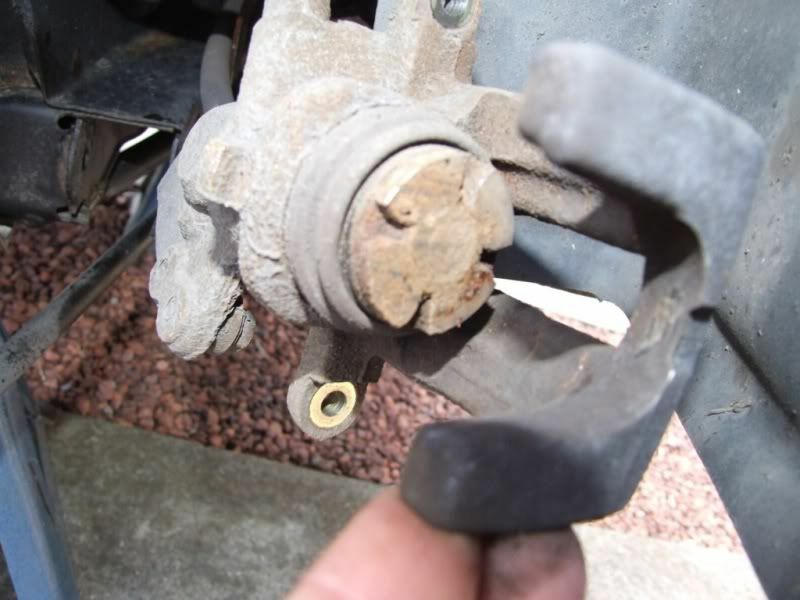 Be careful that the weight of the assembly is not taken by the brake hose as this could stretch or damage it. You can see the piston that needs to be wound back. Here is a better view of the piston showing the four notches that the wind back tool locates into. 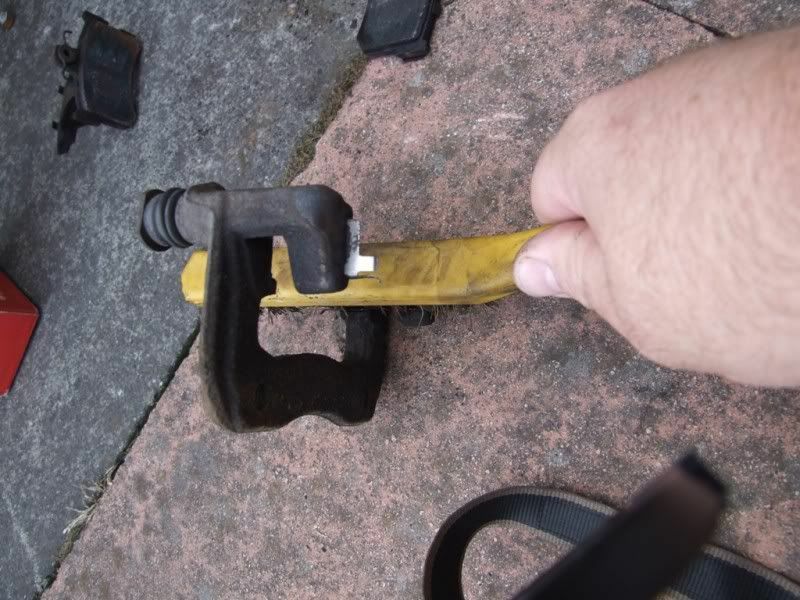 Engage the tool into the notches and, using a ratchet and extension, turn clockwise until the piston is fully home. This will allow the housing to fit over the new thicker pads. 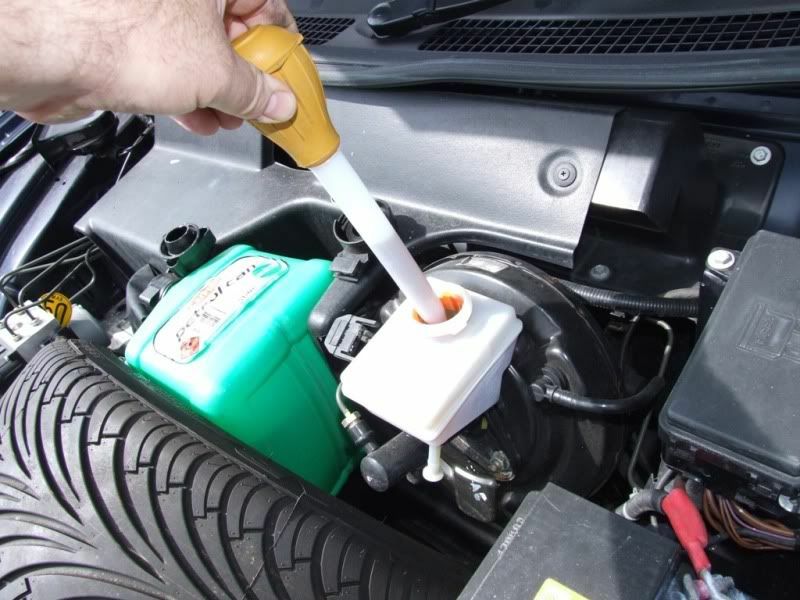 You will need to remove excess brake fluid from the reservoir. When you move the piston back in to the housing it will displace the fluid in the calliper which will feed back to the reservoir and cause it to fill up. If your reservoir is quite full already this procedure could cause it to overflow. I used a turkey baster to remove the excess, it is quite handy but the turkey will never taste the same again. 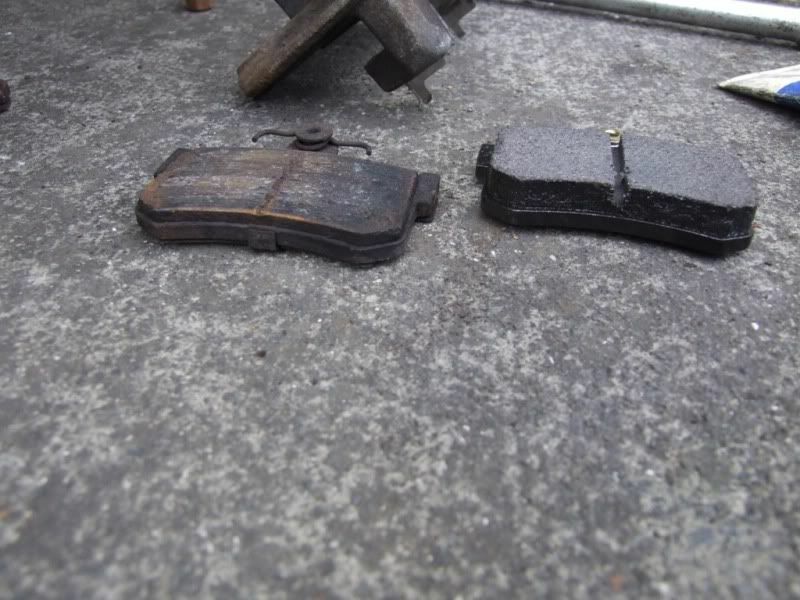 REMEMBER that brake fluid is corrosive, both to you and the car. Dispose of responsibly. 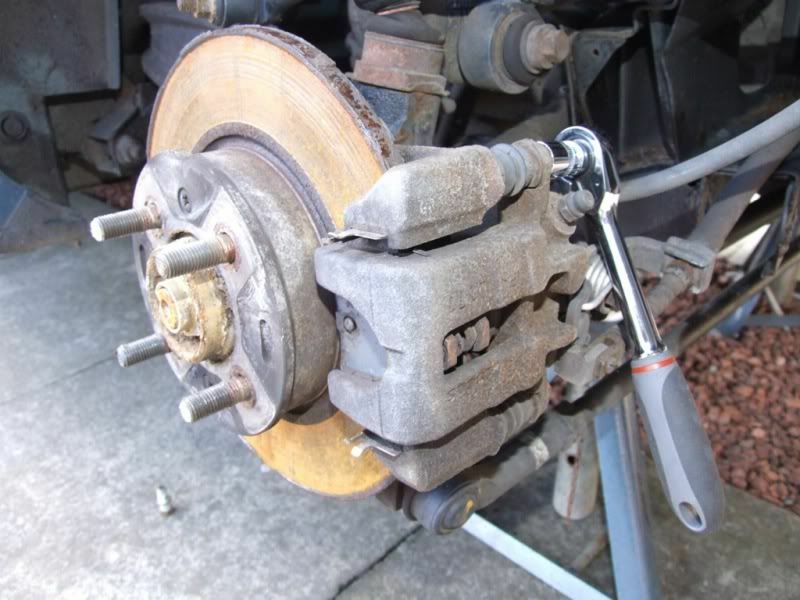 Remove the final part of the calliper by removing the two bolts behind the disc. This now leaves you with the pad carrier complete with old pads. Mine were pretty well stuck in and I had to apply release oil to shift them. 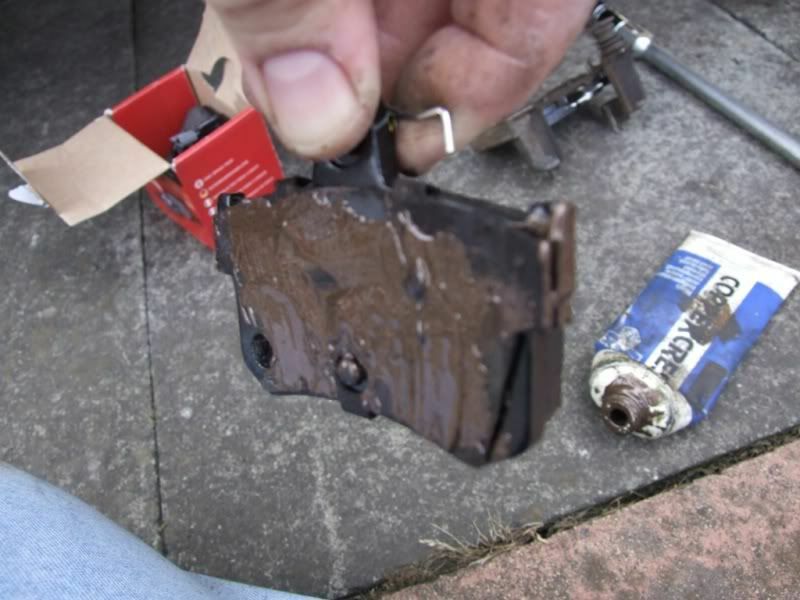 I know it is strange applying oil, but you will be fitting new pads and will be cleaning the carrier when finished. 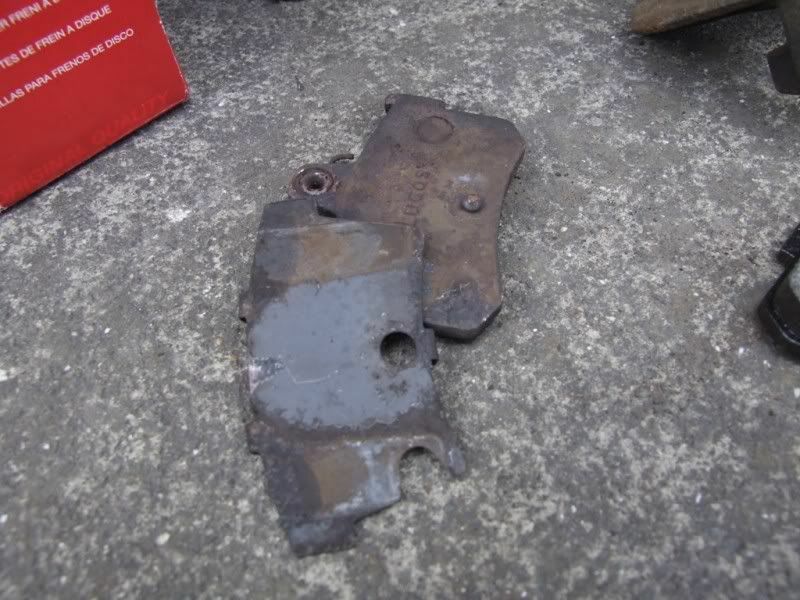 DO NOT apply oil if you will be re using the pads. The grooves have steel clips in them. 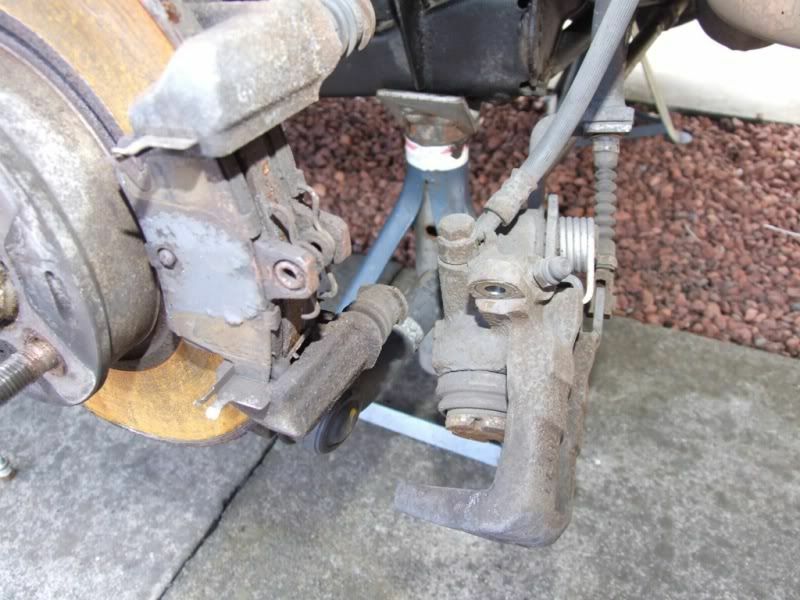 Remove these (Careful as they are quite bendy) and clean them and the grooves again with a wire brush. 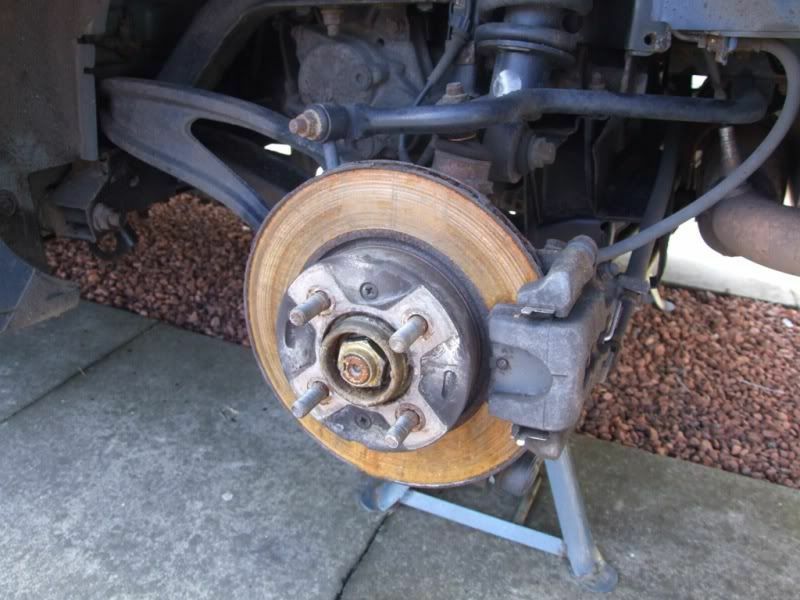 This is to remove any old brake dust and corrosion build up. and fit them to the new pads with some coppercrest. Also apply some coppercrest to the edges. These are the edges that sit in the grooves that you have cleaned out with the wire brush. I had to file these edges to remove some burrs which were causing the pads to stick in the grooves. Test fit before applying coppercrest. Now assemble the pads back into the carrier. First remove the disc retaining screws. I managed to get 3 out with an impact driver, but one sheared. For those of you who haven't used on, you hit the end of the impact driver with a heavy hammer. This pushes the driver forward and turns it at the same time which releases most stuck screws. I would have included it in the photo but I found it difficult holding the driver, hammer and camera at the same time. 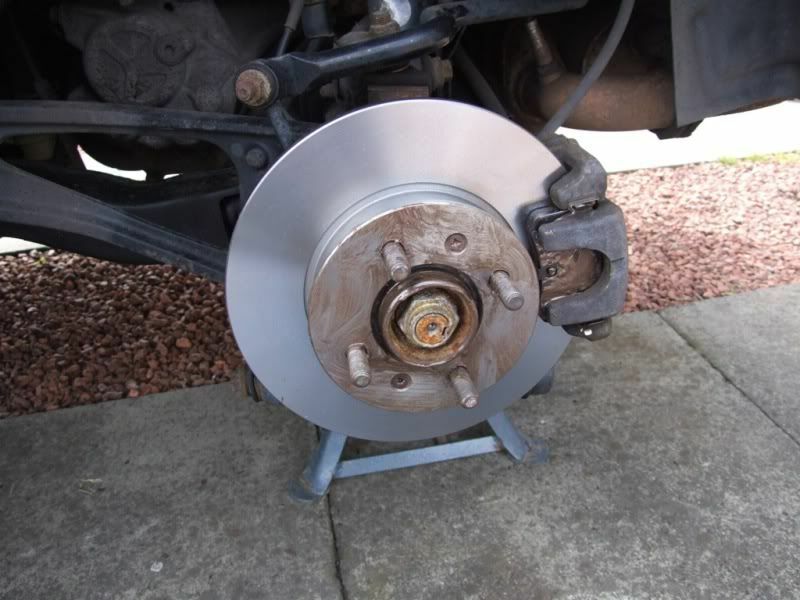 Next you "persuade" the disc off the hub by tapping it from the inside with a suitable hammer. 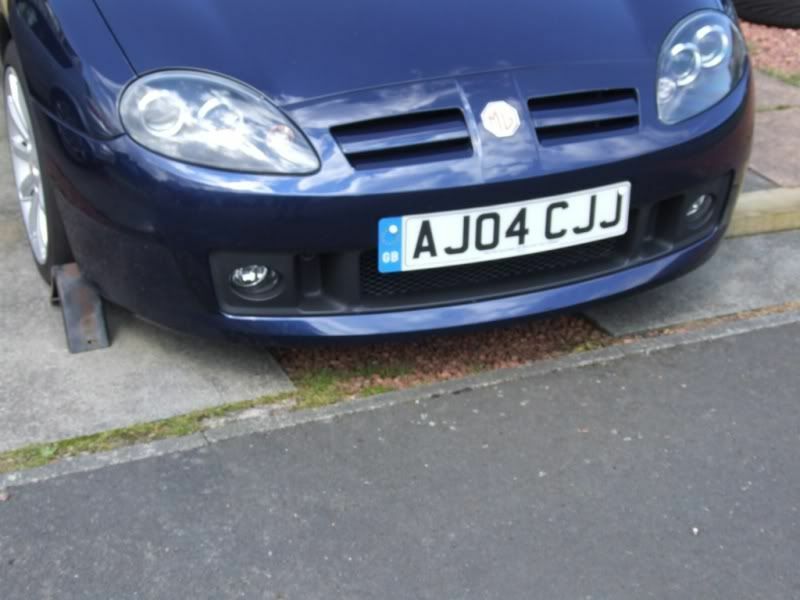 The one in the picture (nearside) came off with no problems, but the offside took some hammering, a long lever and some WD40. it was well stuck. 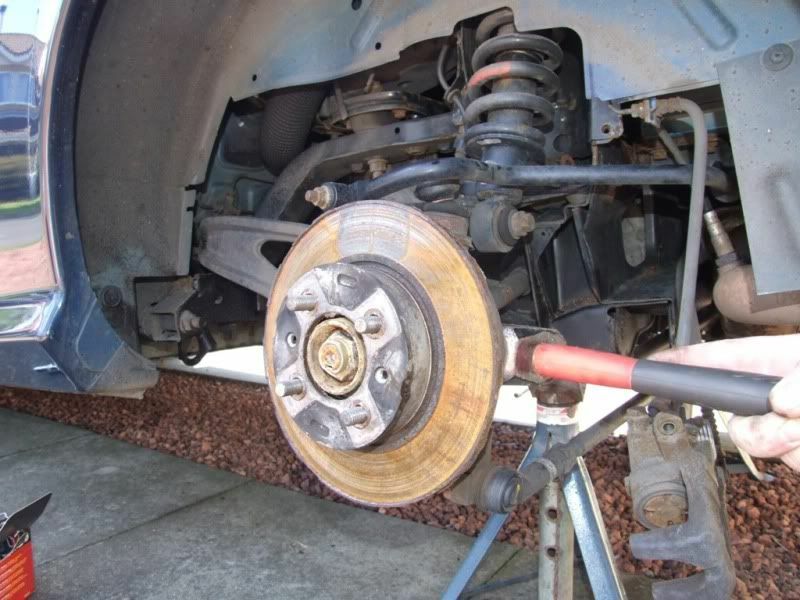 REMEMBER that any force you apply to the disc will be transferred through the suspension components and wheel bearing. Take care. 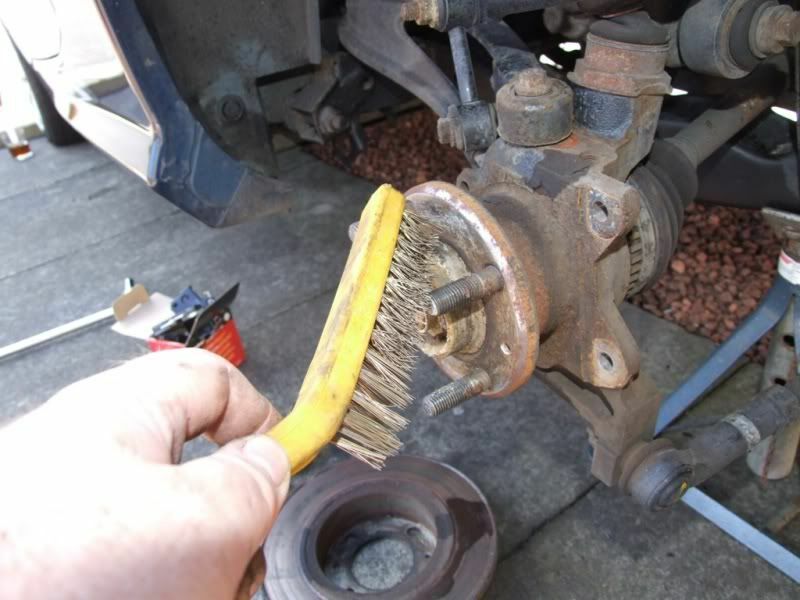 Clean the hub with a wire brush. 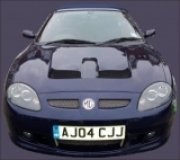 This will help with the fitting of the new disc and will help it seat correctly. Apply Coppercrest to the hub. This will help when you need to remove the disc next time. 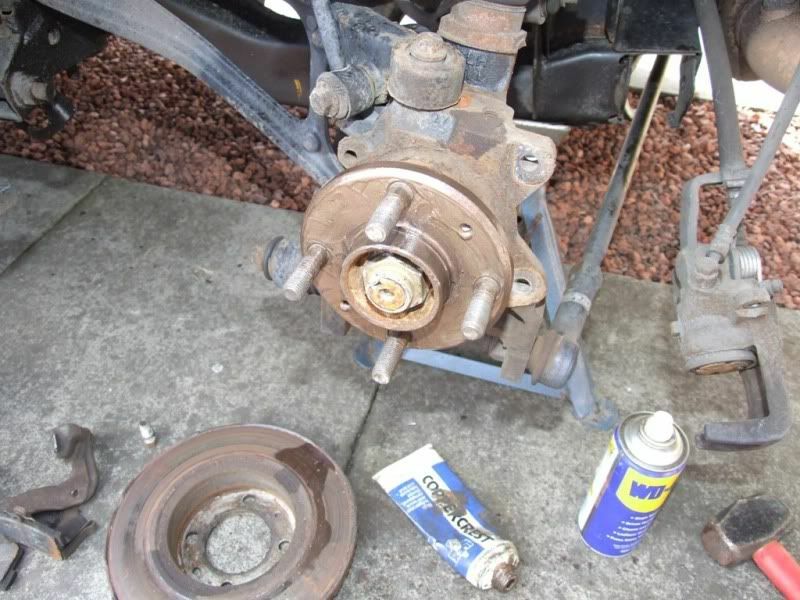 Do not use to thick a coating as this could loosen the wheel nuts etc when the hub heats up and the grease melts. It also spins out at speed and makes a mess on your wheel. 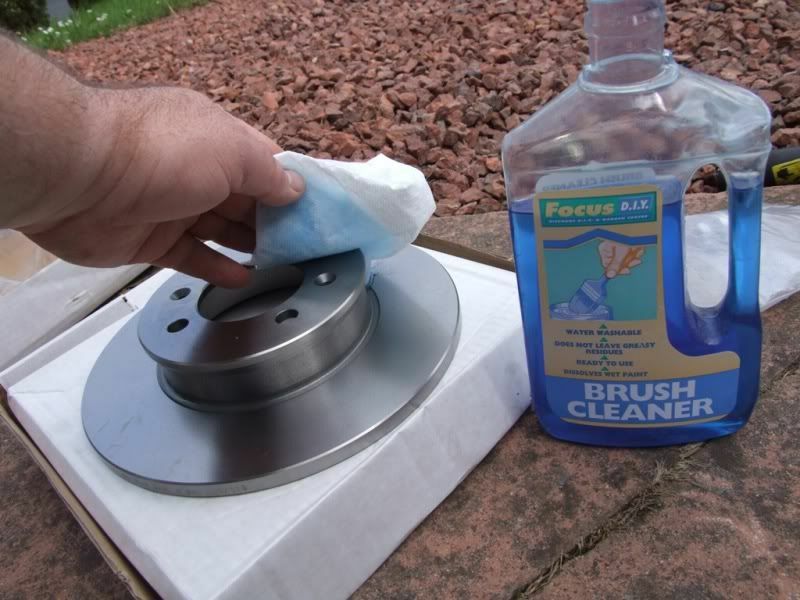 Next prepare the new disc by removing the protective oil with some form of degreaser. Fit the new disc, disc retaining screws and calliper. One tip worth mentioning is after fitting the road wheel to the correct torque, remove it again and retighten the disc retaining screws. 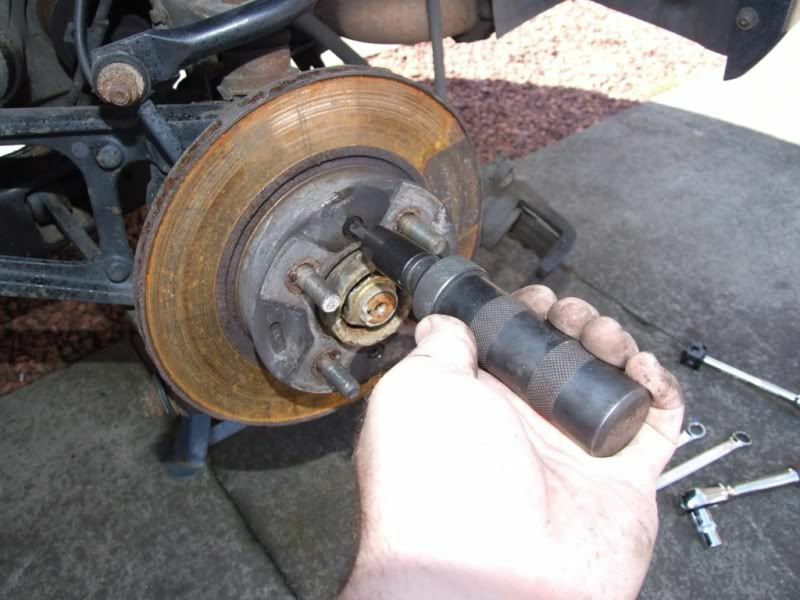 You will find that the action of tightening the wheel on will have forced the disc further onto the hub. Now use the brakes. This will allow the pads to adjust and take up any slack. 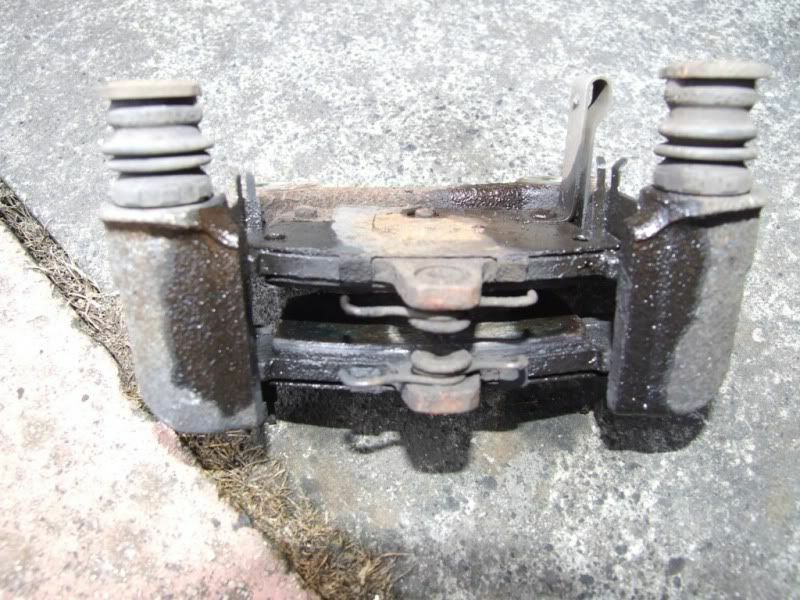 CAUTION:Do not apply the handbrake before the brake pads have been adjusted (using brake pedal) or incorrect brake operation will result. 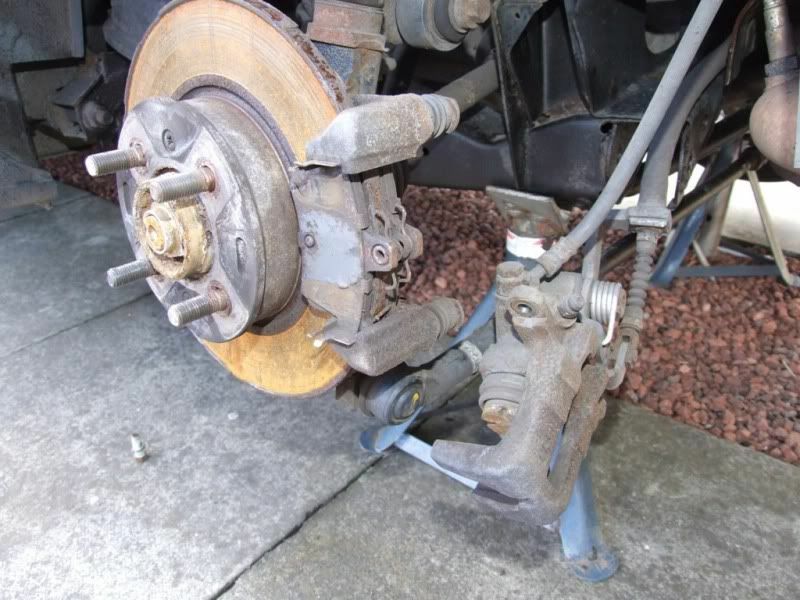 And my brakes are now sorted. Feels tighter and I even managed to lock them today by accident (or at least a little squeal). At which point I should tell you that you should not do any heavy braking until the pads/discs are bedded in. I have disposed of the old discs as I had to apply a fair bit of force to remove them and I don't think they would have been any good. Usual disclaimers apply. This is only a log of how I did it and I can't be held responsible for damage or injury while carrying this out. Good luck. Enjoy. And I hope this helps you out.